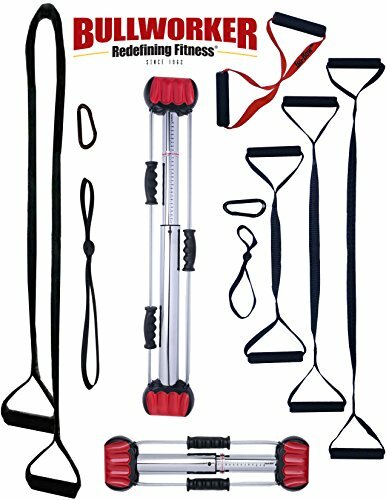 The Complete Cross Training Gym from Bullworker gives you all the equipment you need to accomplish your fitness goals no matter your skill level. The Pro System is designed to engage your entire body with customized focus of Iso-Fitness to save you time and money! Included is the Classic, Steel-Bow, Bow Extension, Sit-at-Home Fitness, ISO-BOW, Iso-Gym and all of the corresponding Charts to give you the complete Bullworker Pro Fitness program. The full line-up is a combination of a Barbell & Dumbbell effect, Body-weight Band Resistance Training. Flexibility and Endurance. 6 Charts - Bow Extension, Classic, Steel-Bow, Sit-at-Home 90-day, Iso-Bow, Iso-Gym - 5 fitness routines for cross training performance Isometric, Isotonic, Iso-Motion, Resiliency, Endurance. Train like a Pro. Bullworker delivers it all for a fraction of the cost of large and heavy home gyms. Over 100 lbs of resistance from a 2-pound device - no band device delivers that. Best of all, this Home Gym set-up goes anywhere you do with no compromises to your routine, Bullworker - Change you can count on - and Keep. 5 Year Warranty and 90 Day Money Back Guarantee. International buyers are responsible for all VAT fees. INTERNATIONAL SHIPPING RATES ARE MORE THAN WE ARE CHARGING. WE HAVE NO CONTROL OVER RISING RATES. If you have any questions about this product by Bullworker, contact us by completing and submitting the form below. If you are looking for a specif part number, please include it with your message.